OLs tried to take emphasis off organizations. Combating the culture of overcommitment on campus dominated many of the conversations at the Fall 2017 New Student Orientation, from group meetings on Boston Common to student-led workshops. 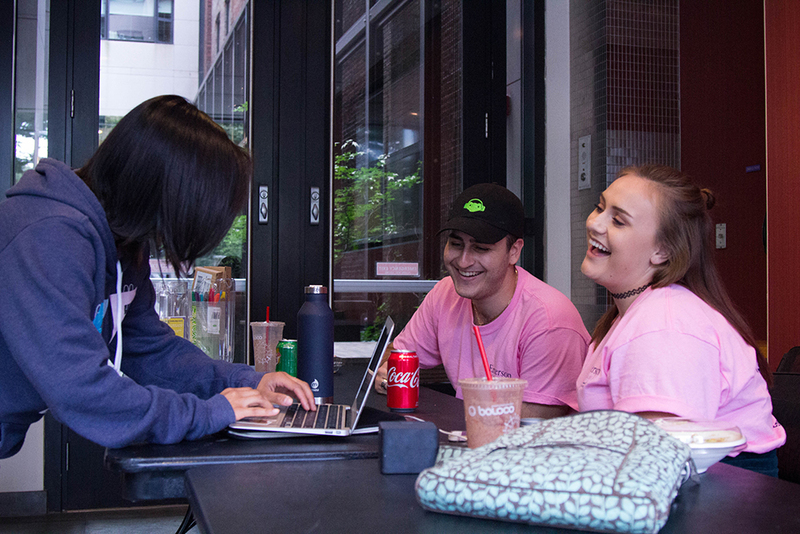 Karin Yehoudian, senior marketing major and orientation core staff, said the Orientation Leader Issues Team designed this year’s training to shift the focus towards building relationships and getting to know Emerson, rather than commitment. In the past, Yehoudian said OLs encouraged students to join as many organizations as possible. This year, core staff discouraged OLs from including the names of organizations relating to the orientees’ majors in their orientation letters and discussing the subject in group meetings, which were common in the past. “We really were pushing to keep the conversations communityand social-based, rather than professional and based on co-curriculars,” Yehoudian said. The term “combating the culture of overcommitment” refers to discouraging students from signing up for multiple organizations right away and instead encouraging them to take their time finding their niche, she said. “As impressive as the opportunities and ways to get experience that Emerson has to offer are, what we have in a humanistic and community standpoint is just as important, if not more," she said. Lindsay Thurman, sophomore performing arts major and OL, said she tried to steer orientees away from the pressure she felt to overcommit when she was a freshman. Thurman said overcommitment was discussed at her orientation in a joking manner. “[Overcommitment] wasn’t really painted as something you shouldn’t do. It was just like ‘this is how it is,’” she said. Thurman said she emphasized that despite all the opportunities there are at Emerson, first year students should focus on their classes and making connections. As a second year OL, Stephanie Galvin said she perpetuated this culture of overcommitment to her first group of orientees last fall. Galvin said OLs tried to start conversations about self-care last year while still encouraging students to sign up for as much as possible. Galvin said she was “undercommitted” her freshman year, but she doesn’t feel like she missed out on anything. Jason Meier, director of student engagement and leadership, said overcommitment is a systemic problem on campus. The offices of Student Life and Student Activities combined to form the office of Student Engagement and Leadership, or SEAL. Meier said the office is working to provide organizations and individuals the resources and support they need. EmConnect is a new resource created to help students connect with organizations, events, and leadership opportunities. Meier said he thinks it will help students combat loneliness and foster a sense of community. The Student Government Association and Meier worked on the service for nine months before its launch on Aug. 25. It allows organizations to promote events for the whole community to see and also has clerical features like uploading documents and budget management. "The emphasis on community is to try to make sure that we’re facilitating the creation of an environment where everyone can feel connected,” said James Hoppe, vice president and dean of campus life. Meier said that EmConnect will serve a lot of students’ needs for information about clubs that was once only available at the Organization Fair. While he said he isn’t trying to do away with the Organization Fair altogether, the event may look very different in the future. Instead of one massive fair, he said he thinks smaller, more intimate meetings can facilitate the sit-down conversations that build relationships.